Memorial Day is a time to remember, recognize, and honor service members who made the ultimate sacrifice while defending our freedom. At Wounded Warrior Project® (WWP), we honor our fallen heroes by fighting every day for wounded veterans who did return home to ensure they get the long-term care they need. 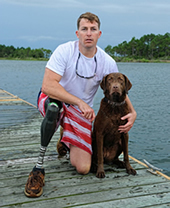 In 2006, Luke Murphy sacrificed his right leg above the knee, after an improvised explosive device detonated next to his vehicle. Countless service members are returning from war with invisible and visible wounds, just like Luke. These brave heroes deserve opportunities that will help them heal and rebuild their lives. Your generous, tax-deductible gift to Wounded Warrior Project® will help provide America’s heroes with the programs and services they need to recover. Click here to join the Advance Guard monthly giving program with a gift of $19 a month or more and receive a WWP blanket.